Brian Burkhardt of St. Louis and Rick Gatlin of Eureka, Mo., claimed the Regular Doubles lead at the USBC Open Championships with a 1440 total May 21 at the National Bowling Stadium in Reno. Burkhardt, a 39-year-old right-hander, picked up the 3-4-6-7 split in the 9th frame, and Gatlin closed with seven strikes to lift the pair past Alex Aguiar of Dartmouth, Mass., and Brian LeClair of Albany, N.Y., who previously held the lead with 1422. Burkhardt and Gatlin have bowled doubles together all but once during their 11-year careers at the Open Championships. Gatlin led the way this year with a 736 series, while Burkhardt contributed 704. As the doubles event came to a close, Gatlin had no idea how close they were to taking the lead. He simply was focused on shooting his first 700 on the championship lanes. Gatlin added 720 in singles and 614 in team for a career-best all-events total of 2070, edging out Burkhardt, who had 710 in singles and 650 in team for 2064, also a career high. 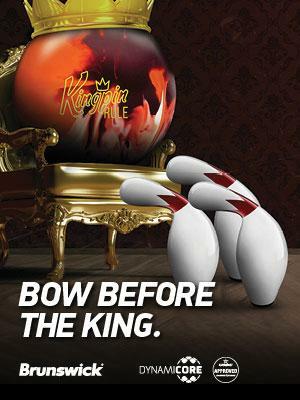 1, Lodge Lanes Too (Mitch Jabczenski, John Gaines, Scott Newell, Vernon Peterson, John Janawicz), Orlando, Fla., 3,538. 2, Junior Team USA Support 1, Mansfield, Texas, 3,521. 3, Leaf Lovers, Justin, Texas, 3,509. 4, Red Carpet Lanes, Waukesha, Wis., 3,499. 5, CareerAthletes.com, Wichita, Kan., 3,469. 6, Team Pabst, Verona, Wis., 3,450. 7 (tie), S & B Pro Shop 1, Clinton Township, Mich., and Shirts4bowling.com, Portland, Ore., 3,439. 9, Buddiesproshop.com, Naugatuck, Conn., 3,438. 10, Linds Lakers 1, Brooklyn Park, Minn., 3,436. 1, Brian Burkhardt, St. Louis/Rick Gatlin, Eureka, Mo., 1,440. 2, Alex Aguiar, Dartmouth, Mass./Brian LeClair, Albany, N.Y., 1,422. 3 (tie), Chris Greene/Joe Keltner, Wichita, Kan., and Joe Conti Jr., Liverpool, N.Y./Derek Magno, Cicero, N.Y., 1,403. 5 (tie), Tony Reynaud, Harwinton, Conn./Glenn Hood, Ellington, Conn., and Patrick Dombrowski, Parma, Ohio/Marc Massie, Alexandria, Ky., 1,399. 7, Marc Scherlis, San Diego/Marv Sargent, Temecula, Calif., 1,397. 8, Russ Wilson, Lawrence, Kan./Jay Futrell, Derby, Kan., 1,396. 9, Ben Hoefs, Mobile, Ala./Henry Teetz III, West Allis, Wis., 1,392. 10, Dave Woffington, Lancaster, Pa./Jerred Poff, York, Pa., 1,387. 1, John Szczerbinski, North Tonawanda, N.Y., 789. 2, Matt McNiel, Prior Lake, Minn., 787. 3, Mike Shady, Fairview, Pa., 783. 4, Aaron Jones, Palos Hills, Ill., 778. 5, Kelly Bonta, Wichita, Kan., 776. 6 (tie), Greg Roberts, Oshkosh, Wis., and Rick Minier, Houston, 771. 8 (tie), Robert Young, Ontario, Calif., and Vince Biondo, Carpentersville, Ill., 769. 10, Brian Himmler, Cincinnati, 767. 1, John Szczerbinski, North Tonawanda, N.Y., 2,228. 2, Dean Billings, Rootstown, Ohio, 2,214. 3, John Janawicz, Winter Haven, Fla., 2,169. 4, Corey Husted, Milwaukie, Ore., 2,166. 5, Joe Keltner, Wichita, Kan., 2,154. 6( tie), Steve Novak, Bay City, Mich., and Andrew Colon, Zephyrhills, Fla., 2,153. 8, Steve Harman, Indianapolis, 2,151. 9, Vince Biondo, Carpentersville, Ill., 2,141. 10, Dean Mueller, Vernon Hills, Ill., 2,140. 1, Junior Team USA Support 1 (Matthew Tuckfield, Steve Novak, Anthony LaCaze, Jeffrey Mersch, Erik Vermilyea), Mansfield, Texas, 10,247. 2, HornswogglerS, Staten Island, N.Y., 10,204. 3, Backhaul Direct - Lumper, Indianapolis, 10,111. 4, Leaf Lovers, Justin, Texas, 10,108. 5, Team Tilt, Lawrence, Kan., 10,065. 6, Red Carpet Lanes, Waukesha, Wis., 10,007. 7, Cambridge 1, Arlington, Texas, 9,988. 8, Linds Lakers 1, Brooklyn Park, Minn., 9,953. 9, CareerAthletes.com, Wichita, Kan., 9,921. 10, Team NABRankings.com, West Henrietta, N.Y., 9,906.